This First Thursday program features a panel discussion related to the exhibition A Different Kind of Picture: Pinhole Photography by Adam Fuss, which was organized by Curator of Academic Programs Liliana Milkova and Olivia Fountain ’17, Anne Lunder Leland Fellow at the Colby College Museum of Art. Panelists will include Milkova, Fountain, and two Oberlin professors from the Department of Classics. Milkova offers an overview of Fuss’s career and his interest in camera-less techniques. Fountain addresses Fuss’s images in terms of the widespread practice in Classical antiquity of applying color to sculpture (called polychromy), as well as artistic practices of critiquing museum displays and narratives. 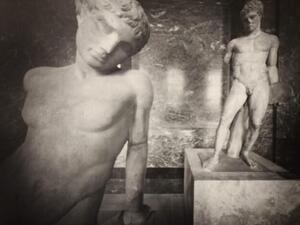 Drew Wilburn, Irvin E. Houck Associate Professor in the Humanities and chair of the Department of Classics, discusses three-dimensional viewership in antiquity and how the pinhole technique subverts ancient modes of seeing. Chris Trinacty, associate professor of classics, will discuss the classical idea of animated statues and the reception of the Pygmalion myth. This event is cosponsored with the classics department. Galleries remain open until 7:30 p.m., with a reception. Due to a scheduling conflict, artist Adam Fuss is unable to join us.